You have a new product that you want to promote. 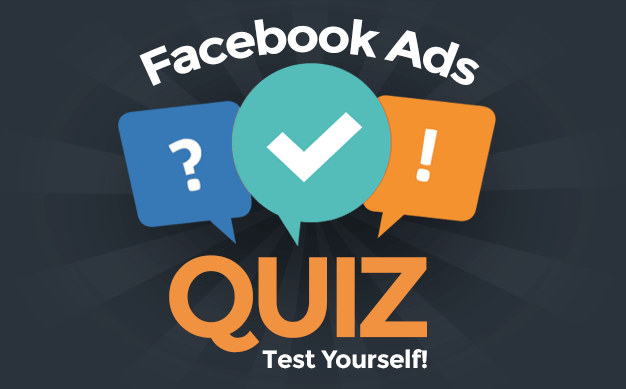 You create a Facebook ad campaign. Should you optimize for conversions or clicks? Now, you have another option with a new Facebook conversion optimization feature: BOTH. One of the many benefits of Facebook advertising is the ability to optimize for a particular action. Facebook has data. They have lots and lots of data. As a result, they have a really good idea about which groups of people are more likely than others to click, convert, or engage. The power of Facebook advertising is found within the first two options. Facebook knows who (within the audience you’ve selected) is most likely to convert or click a link. You don’t need to waste money on those least likely to perform those actions. When you optimize for an action, Facebook won’t show your ad to everyone within your audience. Instead, they’ll focus only on those most likely to perform the action that you want. If you want to sell more of your product, the logical assumption would be to optimize for conversions. While optimizing for conversions, you first tell Facebook which specific conversion you want to optimize for. If I’m selling my Business Manager training program, I’d logically want to optimize for that. Facebook knows what types of people have bought my course before because I have the Facebook pixel on my website and created a Custom Conversion for that product. So Facebook can learn about what those people are like so that they can find more people in my audience who are just like them and likely to buy. But here’s the problem: What if my product is new? What if only a couple of people have bought it so far? Facebook won’t have enough data to properly optimize. Facebook says that in order for its systems to properly optimize, you need to receive a minimum of 15-25 of those conversions per week. Obviously, the more high-quality data that Facebook can work with, the better. But that’s the minimum. What, then, do you do if you aren’t getting that many conversions? Or you could optimize for link clicks to drive more people to the landing page in an effort to get more conversions. Many advertisers optimize for link clicks until they get enough conversions for Facebook to properly optimize. Then, they switch to optimize for conversions. That method is a bit messy, of course. It’s manual. You need to make assumptions. How long should you optimize for link clicks prior to switching to conversions? How many conversions is enough to properly optimize for conversions? 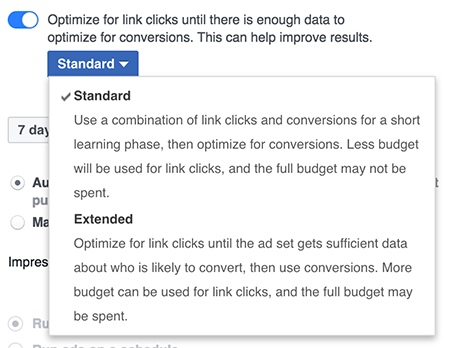 Thankfully, Facebook is rolling out a new method that will automatically switch from optimizing for link clicks to conversions! If not enough people have seen your ads and taken action, we may not be able to optimize for conversions. We will optimize for link clicks until we have more data, then start optimizing for conversions. That could be pretty dang helpful. Let’s break down those two options now. This is the default (or “standard,” I guess) option. Once that happens, optimization will switch automatically to conversions. Note that Facebook doesn’t care if your campaign is running for less than a week. They also don’t care if you’ve already used up your budget. Theoretically, you may never switch to optimizing for conversions if you never hit one of those thresholds. With this option, Facebook will optimize for both link clicks and conversions until you generate 15-25 conversions or your budget is spent. Facebook won’t switch to optimizing for conversions entirely until you reach that 15-25 conversion threshold. While you may get more conversions early with this method than with Standard, you’re also at risk of driving lots of traffic without any conversions since Facebook will have a difficult time optimizing for those conversions. First, know that this method isn’t magical. It doesn’t replace the normal way of optimizing for conversions if you already have enough conversions to properly optimize. If that method is working, don’t expect this to improve your results. Standard is the default option because that’s where Facebook thinks most advertisers will find success. If you want to generate more volume to eventually optimize for conversions, use this method. If your focus is instead on making sure you spend your entire budget or get full delivery, Facebook suggests Extended optimization. Not sure what’s right for you? Facebook says to start with Standard optimization and switch to Extended if you don’t get enough delivery. Have you started to experiment with these optimization options yet? What results are you seeing?